The latest version of Magican has enhanced features! This free Mac cleaner helps users to speed up Mac in all directions! Use Magican 1.4.6 to clean duplicates, cashes and leftovers. Help monitor systems, CPU usage and fan speed in real time. 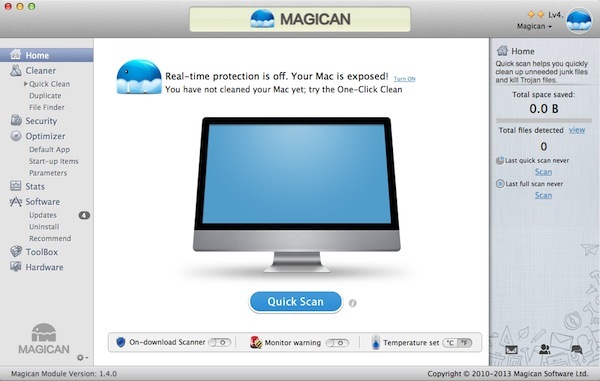 Ensure your Mac's security with Anti-Trojan and with other Magican features that both detect and remove viruses and scan all downloads. The Magican software center includes update reminders and an app uninstaller option. It also recommends exciting, free and discounted apps from the App Store! Magican scans files with one click! Magican scans for uselss files (system caches, language, binaries and app leftovers) and for viruses and trojans. 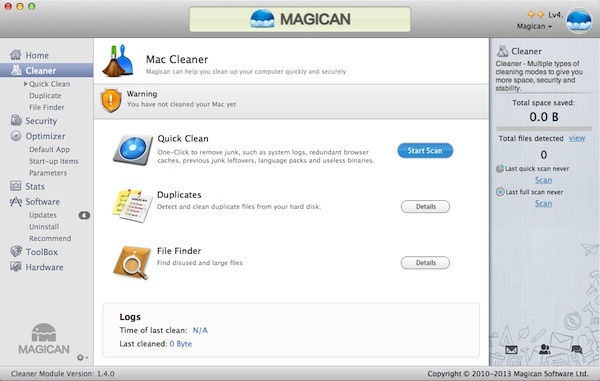 Magican cleans Macs with a one-stop solution, regardless if you're cleaning infected files or redundant data, both can be permanently deleted or moved to the trash at will by using Magican. Magican adds buttons to optimize basic settings, including scan downloads, monitor warnings and display temperature. Magican displays scanning results, such as total saved space, scans on downloads and scanning time, on the right-hand sidebar.